Cologne, Germany has been an important Catholic bishopric since the 3rd century, and boasts many fine churches. The Cathedral of Cologne, that slightly menacing, spiky, monster crouching next to the main train station, is only the most famous. Cologne also boasts a dozen nice Romanesque churches within its city center, built between 900 and 1200. I find Romanesque churches soothing. They’re not intimidatingly huge, and the interiors are filled with pleasant, rounded forms like arches and cupolas, instead of Gothic gloom and pointiness. I usually try to visit one or two of these churches when I go to Cologne, which I did for New Years’. This time it was the St. Aposteln Church, located near the big Neumarkt transit hub. St. Aposteln is kind of unusual because it’s successully solved a tricky problems: tasteful modern church decoration. If you don’t have any 16th-century frescos on your walls, or if the ones you did got bombed, what do you replace them with? Good old-fashioned pictures of conventional blond Christs with flowing locks and Marys with blue vestments seem anachronistic and stodgy. But then again, a pure abstract composition will outrage the reactionaries, and just don’t seem churchy enough. "See that floating field of red? That represents Joseph." The result, therefore, is usually some sort of unsatisfying combination of figural painting and abstraction. An example can be seen at the left, the altar of the Church of Saints Peter and Paul in the Roman suburb of EUR. A sort of horribly misguided arte povera mishmash that I calll The Redeemer of the Scrap Metal. Behold, and then avert your eyes! But it can be done right, as St. Aposteln shows. 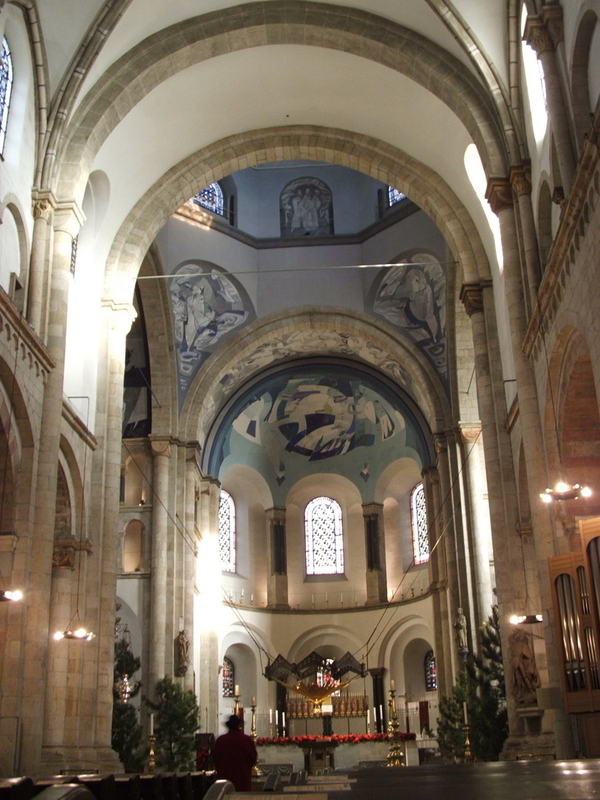 During World War II, the 19th-century mosaics decorating the choir were severely damaged. The church authorities described this as good news, since the rather twee and saccharine mosaics looked extremely dated by the 1950s. After what were probably dozens of agonizingly long meetings and negotiations, the authorities finally decided to hire a ‘church painter’ named Hermann Gottfried to decorate the 3 conchas (or "half-cupolas") in the choir. Since the basic structure has been on this spot in Cologne for almost 900 years, Gottfried has to think about how people might view his work, say, 500 years from now. Assuming there aren’t any more world wars during that time, of course. Gottfried started his cycle of modern paintings, which are based on the Biblical Revelation to John, in 1988, and finished five years later. Here’s a page (G) with more information. The colors are mainly gray and blue, to fit the church’s subdued tone, but there are blazes of red (for the Woman Clothed with the Sun) and orange (around the Lamb). The composition makes fascinating use of the curved, recessed space provided by the cupolas. Energy-filled planes of abstract forms clash and meld. However, recognizable images (a lamb, a crowd of people, Mary) emerge from the abstraction. Some of the figures are surprisingly graceful, others distorted and slightly menacing, as befits this weird apocalyptic text. 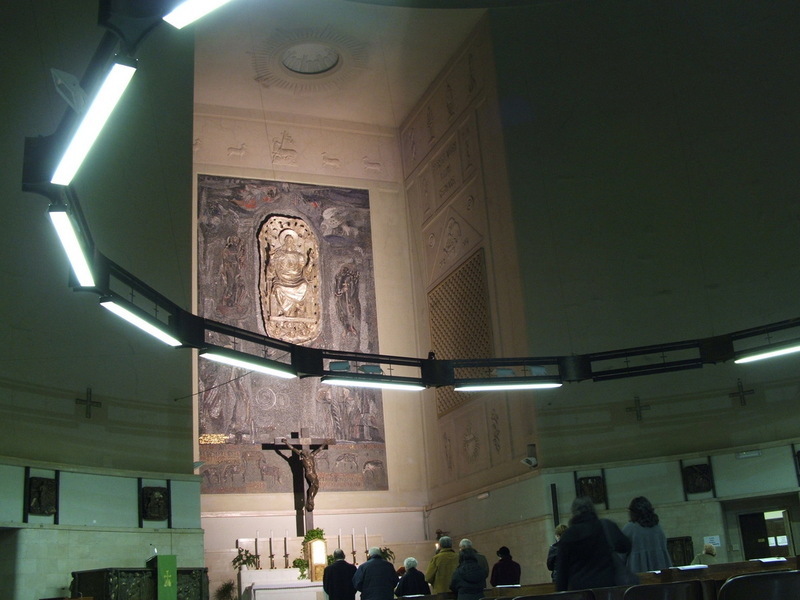 The picture at the right shows the painting behind the altar, which depicts the Throne of God. It’s completely abstract, but there are more figural paintings on the sides. I visited Koln in 1991, I think but I may not have seen St. Aposteln – or perhaps the paintings weren’t their. I did see a number of the famous Romanesque including St. Gereon??? I was very impressed with the stained windows. Very modern and abstract but beautiful. And quite fitting to the religious atmosphere. I’d like to return one day. Judging from her comment alone, Melanie Stephan is clearly in need of help. For more proof, simply perform a search using her name, and see all the similar comments on other blogs. Read what God had to say during the month of Aug. 2007, on this website: Non-Prophet, Are you going to Hell? Here Melanie gives proof that God made contact in the story of 3 famous people: Mike Douglas, Merv Griffin and Nancy Reagan. Melanie also has linked Mike and Merv together before Merv dies on this site: ‘Melanie the Crackpot Christian – Escaped Mental Patient’. The proof is overpowering here. Enjoy! !